Genuine Napier spare parts are manufactured to precise tolerances in the same product factory as our OEM turbochargers, where they undergo stringent testing to ensure quality, reliability, longevity and safety. Only by using genuine spare parts can you maintain the integrity, performance and reliability of your Napier turbocharger and even prolong the lifecycle of both the spare part and the whole unit. Our genuine parts are only available from Napier or one of our authorised distributors, with an extensive range available for shipping anywhere in the world at a moment’s notice. For your complete reassurance, each spare part comes with a full product factory OEM warranty and certificate of conformity. Our interactive Parts Finder is now also available to help you source exactly the right spare part (from many thousands!) for your needs. If you require any additional assistance, our experienced staff will be pleased to help. Use of the Napier Turbochargers Parts Finder is subject to terms & conditions. 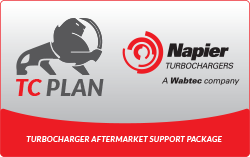 Let us worry about the maintenance of your Napier Turbochargers. With TC PLAN we stock items needed for your next overhaul in advance so your downtime is less. TC PLAN customers receive discount on parts required during overhaul and support is offered by a customer contact dedicated to your needs.